Have you ever noticed how as we age, people seem to mumble more? It couldn’t be our hearing! I hear just fine -- except for the fact that I have to strain to hear conversations and the television. As we grow older we naturally experience some hearing loss -- a sequel to exposure to loud sounds like music or environmental sounds damaging the hearing mechanism. Cats can have hearing loss too. Most hearing problems in cats are associated with aging but other less common causes may occur and often very mature cats become completely deaf. In most cases of age-related hearing loss, deafness occurs as a result of damage to the ear system and nerves. It is primarily a degenerative change. Hearing may also be diminished by obstructions in the ear such as debris, infections, masses or even medications. These should all be ruled out before making a diagnosis of degenerative hearing loss. How can my cat be tested for hearing loss? Tear a piece of paper behind the cat’s head. Make sure you don't touch the cat but he should turn and respond. Crackle a bit of tinfoil or jingle a bunch of keys when he is sleeping or not looking. This tests high frequency hearing. Hiss. This is a universal danger sound. Shield your breath with a tissue or clothes so he can't feel you blowing. Tap a cardboard box or something that makes a drumming noise to test low frequency hearing. 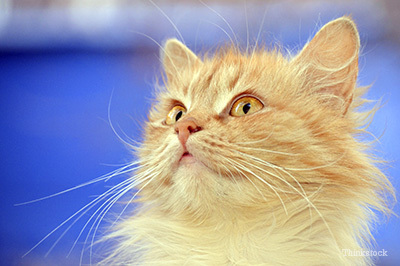 What can you do should your cat go deaf? Deafness is often insidious, progressive and irreversible. People ask about hearing aids and certainly they have been used successfully in dogs but it is extremely unlikely those would be tolerated by a cat and would be easily lost. How to protect your deaf cat? Deaf cats just like deaf people are sometimes at increased risks, especially outdoors. They cannot hear an oncoming car. They cannot hear another cat that may be aggressive or a dog that may pose a threat. For this reason alone it is particularly important that hearing impaired cats be kept indoors unless on a leash. Similarly, deaf cats cannot hear their owners calling them and should they wander away they can be very difficult to find and return. All cats should be implanted with an identifying microchip but this is particularly critical for deaf or blind cats. A deaf cat can still be a great pet! He will just need more affection, patience and a few more “I love you” signals. 1. “Diagnosing Deafness in Cats.” Pet Wave.